Now comes in Black, Maroon, and Blue. This versatile mill provides an adjustable dial that allows fine to coarse grinds, while the cap keeps spices dry in humid conditions. The grinding mechanism is made from an advanced ceramic close in hardness to diamond that will never rust providing flavorful results and ultra long-life performance. Excellent for sea salt, rock salt, wet salt, peppercorns and seeds. The clever upright design of the mill will keep your shelves & counters clean from residual grinds. The re-usable glass container is dishwasher safe. Grinder: Advanced Ceramic. Container: Glass. Made in Japan.6 inches tall. Holds about four ounces of salt. 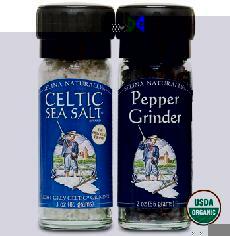 Convenient and attractive grinders are great for use at home and they are a nice way to introduce family & friends to healthy and great tasting Celtic Sea Salt®! These Grinders come with 3 ounces of salt and two ounces of organic peppercorns. but they’re reusable at least five times. New! 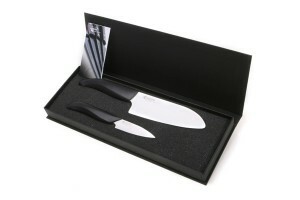 Learn about our Kyocera Ceramic Knives & Graters.